The HHR isn't for everybody--but if you like the style, you'll love this car. There's more to it than style--there's the great driving position, so easy to get in and out of, comfortable seats, quiet smooth ride that's also peppy with good cornering. Whether you drive on freeways or back roads, the HHR will be a comfortable, practical -- AND FUN car that you'll really enjoy. 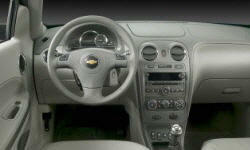 Why the 2010 Chevrolet HHR? I LOVE the look of this car--it's retro, but modern. It has personality! Because it's tall, there's kots of head and leg room--also plenty of hip room from side to side--much roomier than other cars in its class. Also--it's so easy to get in and out of--you just step into the car--you don't have to climb up or slide down--great if you have a bad back (and the seats are, too). This also gives you a driving position that's higher than a car, but lower than a truck. Visibility is good all around--even though the front pillars are wide. Simple, convenient, super easy ingress and egress. Nice stylistic touches of roundness, from the vents to the door handles. Extremely comfortable, supportive seats (with electric lumbar support), good visibility all around. Headrest is in the perfect position--close enough to actually rest your head (and good for protection), yet not intrusive. Materials wear well. Very smooth, and quiet--feels lux, but with good handling. Relaxing, even on long drives. 63 cubic feet of interior room--that's a LOT of space for a small car--much more than a Soul, Cube or Countryman. And--unlike the Soul or Cube--there's still a lot of cargo space with the back seat up, 25.2 cubic feet--more space than full size sedans (a Mercedes S Class only has 16). Very smooth, quiet, and surprisingly peppy. The standard model isn't a sports car, but has great pickup for getting on the freeway, and composed, controlled, reliable handling on curvy roads. Predictable power band--no lag. Flat around corners, stable on the freeway. Average around 22mpg in the city--and up to 36 on the freeway. Combined driving easily averages 32mpg. Predictable--you know what it's going to do--no surprises. But that doesn't mean it's dull, there's little body roll and it's very crisp and clean on curvy roads. 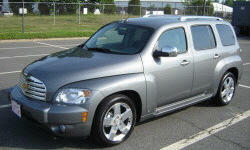 Why Not the 2010 Chevrolet HHR? The only thing negative I can find to say is that the color choices are limited! Interiors are black, gray, or beige. The beige have a two tone dash that's quite nice, though the light interior fabric shows dirt more easily. It would be nice if American cars could do what Mini and now Fiat do in terms of color and customization. But--given that the HHR is now out of production and if you buy one, it will be used, it's a moot point! The car looks best in silver and a dark titanium color--but if you like red or blue, it's good in those, too. This small 4 cylinder engine gets great gas mileage but can only tow 1,000 lbs. I compared it with a Mazda3 (great handling but less space and didn't like the seating position), ScionxB (older ones are tinny, newer ones are ugly and cheap), Nissan Cube (very cute but very small, less space, not good on curvy roads), Honda Fit (loud engine, not fun to drive, less space), and I kept coming back to the HHR. I rented one, had it for a week, drove it long distances on many different kinds of roads.